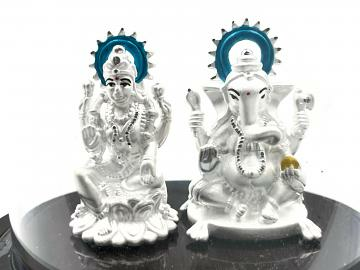 LORD GANESHA & GODDESS LAKSHMI / LAXMI silver idol is made of pure silver and comes with cherry wood round wood stand and hard plastic cover. Reference Idols were first crafted in clay by Skilled and Reputed Sculptors and then converted into Silver Form. All orders are shipped in 1 to 2 business days via USPS from Arizona, USA. If for any reason, you are not satisfied with our product, please reach out to us within 30 days for return or exchange. - If merchandise was shipped free, upon return / exchange, the initial shipping cost will also be FREE to the customer. - A 10% restocking discretionary fee may apply to item found to be USED and then returned. This item in Silver Idols, Statues & Coins category was first added to our catalog on 10-26-2018. Buy Intricate Design 999 Pure Silver Ganesh & Lakshmi Statue (# 04), sold & shipped by Sanskreeti Jewels where you can shop online for Exclusive Collection of Silver & Gold Jewelry, Idols & Coins. This Pure Silver Statue collection has been tagged as hindu religion, hinduism, religious murti, Art, sculpture, pure chandi statue, silver idol,Ganesh,ganesha,ganpati silver idol,ganesh idol, silver murti,diwali,dipawali,electroform idol,Lakshmi,Laxmi,Lakshmi Ganesh. All Pure Silver Product are 999 ( 99.5%) pure silver and certified by Indian Bullion Association, inspected and verified by Indian & US CUSTOMS. Silver Purity Guaranteed, Life time 100% money return guarantee for purity.